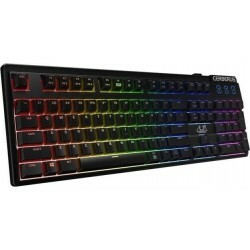 The Redragon Vata is a 104 keys anti-ghosting mechanical RGB gaming keyboard with macro keys and dedicated media controls. The Vata sports 18 backlight models, 2 side lighting settings, as well as a highly durable and lightweight design due to its sleek aluminium alloy panel. 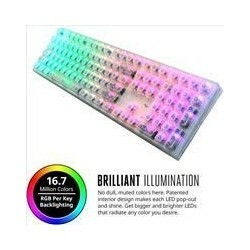 This keyboard has OUTEMU blue switches with 50 million click durability and double-injection moulded keycaps. Waterproof and dust resistant. The programmable macro keys can record macros on the fly, so it's easy to edit your own macros on this stylish keyboard. Dedicated media controls let you quickly play, pause, or skip music tracks right from the keyboard - without ever interrupting your gameplay. Also, designed with a volume/backlight adjust wheel.